Peterborough NECI (blue) in action. Peterborough NECI make a third attempt to play their third round tie in the Northants Area Cup tomorrow (March 10) and they are not happy. The tie was first abandoned last month amid allegations of the Weldon manager refusing to leave the field of play and a second attempt two weeks ago was declared null and void when Weldon were found guilty of playing an ineligible player after winning 3-0. NECI, a Peterborough League Division Four side, believe they should have been awarded the tie, but Northants FA instead ordered a second replay tomorrow. The game is scheduled for 2pm at Werrington Sports Centre. There’s a Cambs County Cup semi-final for Whittlesey Athletic B at Meldreth tomorrow, while there is also semi-final action in the Peterborough League’s Intermediate Shield and League Shield. Moulton Harrox moved back to the top of the Peterborough Premier Division on Wednesday (March 7) with an emphatic 11-0 win at Warboys Town. They are at reigning champions Peterborough Sports Reserves tomorrow whn second-placed Stamford Lions host Sawtry and third-placed Netherton United are at Holbeach United Reserves. 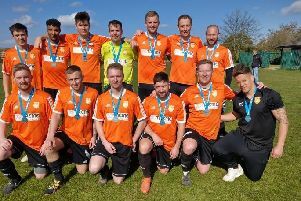 The PFA Senior Cup semi-finals between Netherton United and Polonia, and Moulton Harrox and Whittlesey Athletic will take place on Saturday, April 7. Premier Division: AFC Stanground Sports v Thorney, Holbeach Res v Netherton United, Ketton v Whittlesey Athletic, Peterborough Sports Res v Moulton Harrox, Stamford Lions v Sawtry, Sutton Bridge United v Warboys Town. Semi-final: FC Parson Drove v Feeder. Semi-finals: AFC Orton v Stamford Lions ‘A’, FC Peterborough Res v Eunice Huntingdon. Third round: Peterborough NECI v Weldon Reserves. Semi-final: Meldreth v Whittlesey Athletic B.